When Halloween came and went, I had a bunch of Reese’s Miniature candies leftover. Not quite as many trick-or treaters this past year. What was a girl to do? 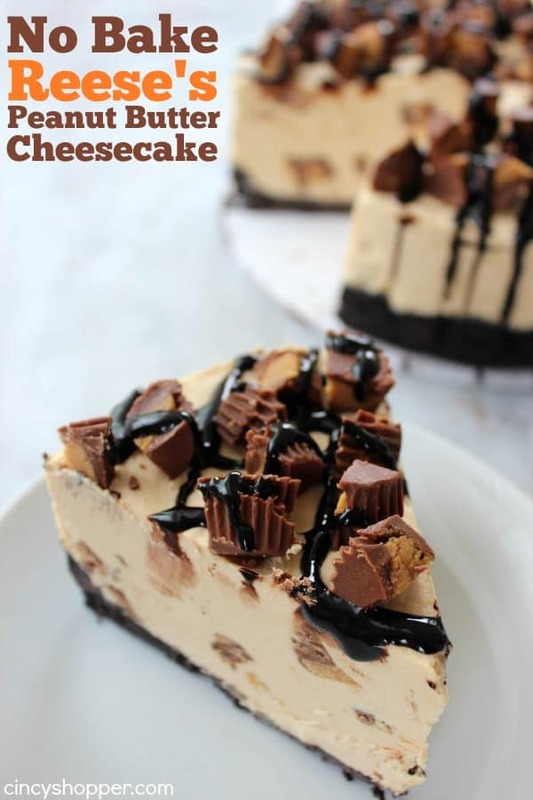 I made a yummy No Bake Reese’s Peanut Butter Cheesecake. 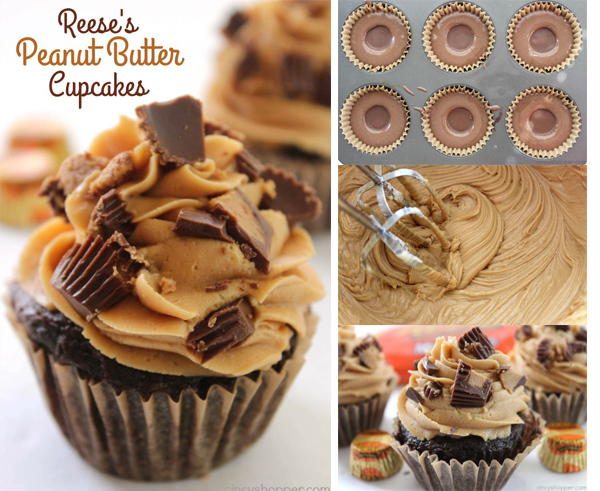 And I also made these super simple Reese’s in the middle cupcakes. I meant to share these cupcakes with you in November and got very busy with the holidays. So they are now finally getting put on the blog. Since I used a cake mix that I had on hand, these are super simple. 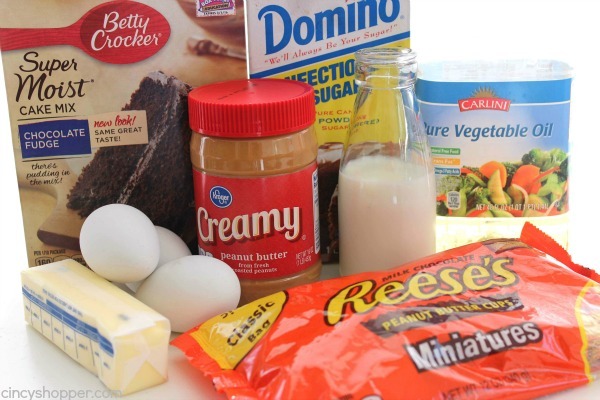 Cake mixes can really speed up the process when I am just needing to make a quick dessert. I made a super yummy peanut butter icing to put on top. 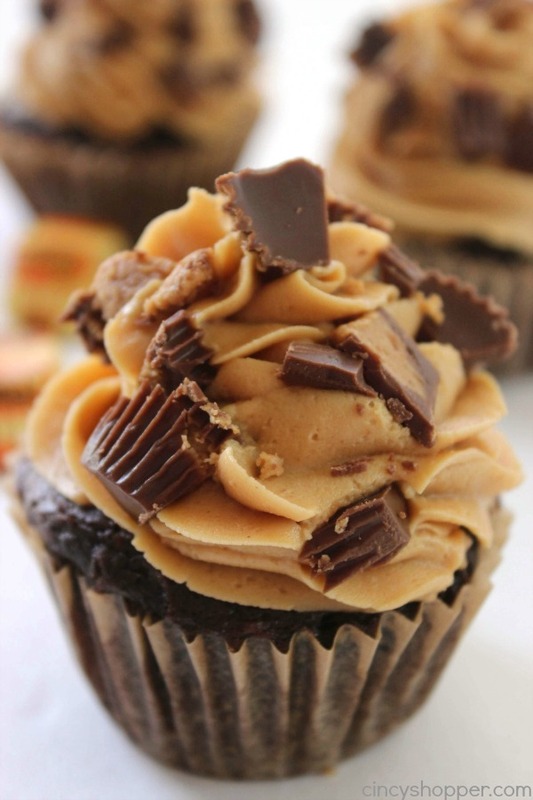 Grab yourself a cake mix, peanut butter, butter, and some Reese’s candy. 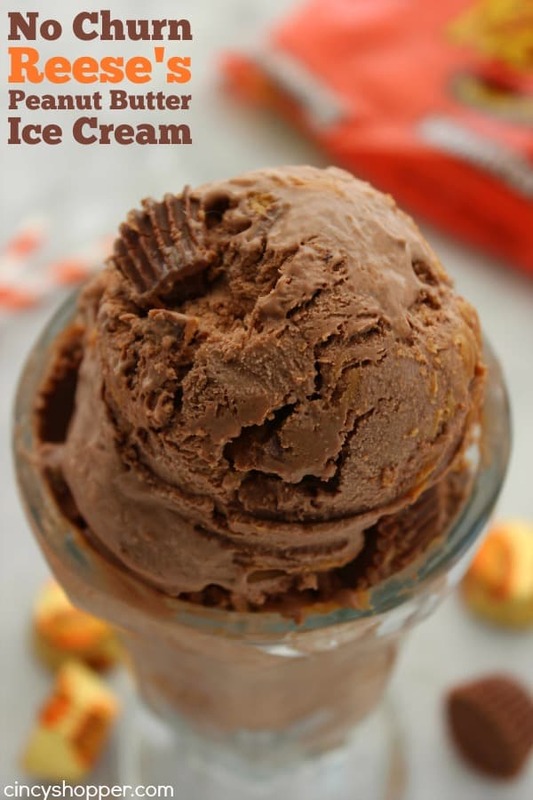 You could also use full sized Reese’s cups but it could get a bit pricey. I remember the days when candy bars were only $0.25 each, now they are like $1.25 if you are purchasing at full price. YIKES! Fill liners about 1/2 full with batter. 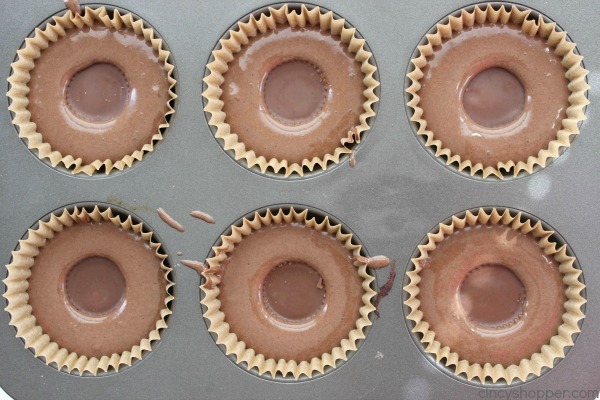 Place a Reese’s into each and gently press in place. Slowly adding in the sugar,it gets too thick then adding a little milk to thin. 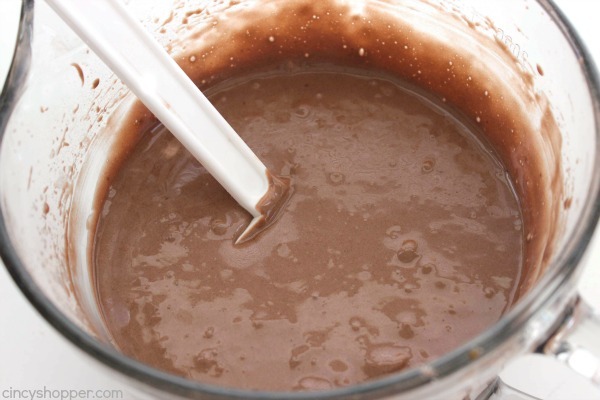 Continue until all of the sugar is in and the frosting blended and right consistency. Transfer to piping bag and pipe onto each cupcake. Chop up remaining peanut butter cups or use chocolate syrup to garnish cupcakes. 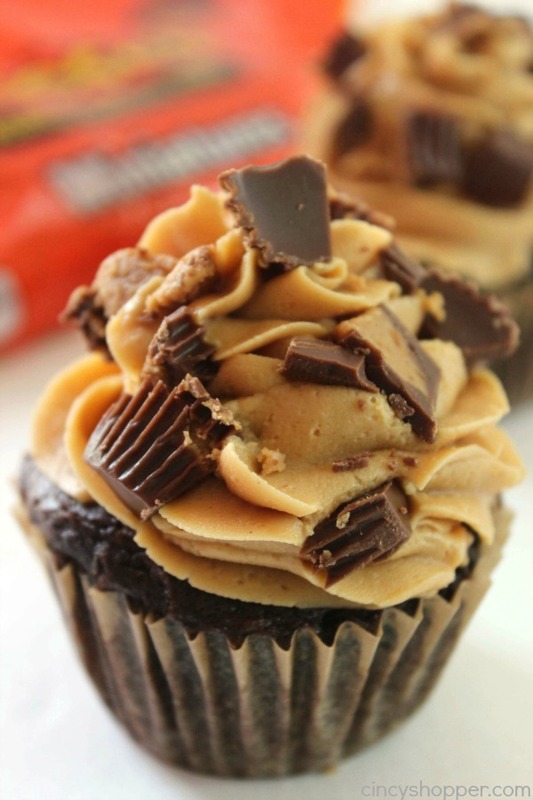 Do you have a favorite Reese’s dessert? Place a Reese's into each and gently press in place. Sweet Mother of Pearl! I feel my New Year’s resolution slowly slipping away! This recipe looks so delicious! Hi, I’m Anita visiting from Luscious and Light Recipes. Oh my gosh yum! 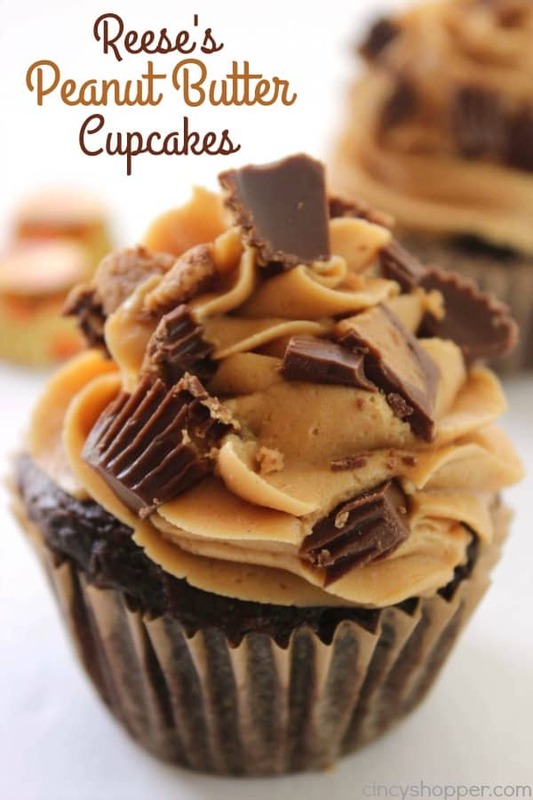 My husband’s favorite candy is Reese’s Peanut Butter Cups and his birthday is coming up, maybe I will make him these! Making these tonight for an event tomorrow… wanted to go on & frost them, but was curious if you’ve ever made them ahead & froze them? LOVE LOVE LOVE this recipe!!! SO tasty! Made them around Easter so Reese’s had little bunnies that I stuck on top of each one! So cute! Crowd favorite! I ended up cooking them for only about 13 mins and added extra mild to my frosting so the little goodies where nice and gooey! THANKS for the great recipe!! These cupcakes were awesome! I made them for a birthday and was told that they were the “best cupcakes I’ve ever had!” Thanks fora great recipe! 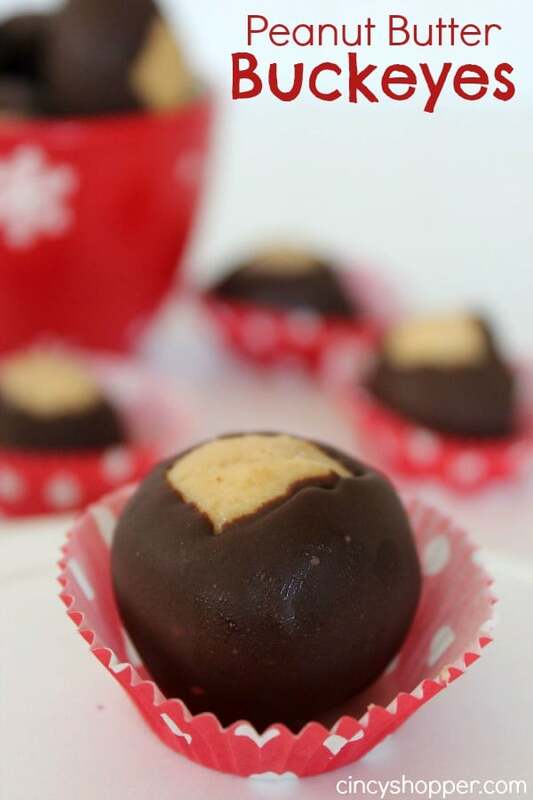 Love the recipe, just wondering if any one has any suggestions about keeping the peanut butter cup from sinking all they way to the bottom and getting crunchy? Thanks for this great recipe. I made these last night and brought them to work today for a birthday treat. They were a huge hit. My coworkers love chocolate and peanut butter. I tried piping the frosting but it seemed too thick. I ended up just frosting them with a knife which worked just fine. Thanks for the great recipe. I made these for a birthday treat for a coworker. They were a big hit. I tried piping the frosting but mine was a little thick so I just used a knife to frost them. I used a Betty Crocker SuperMoist cake mix, which made 24 cupcakes. A 12oz bag of mini Reese’s was plenty. 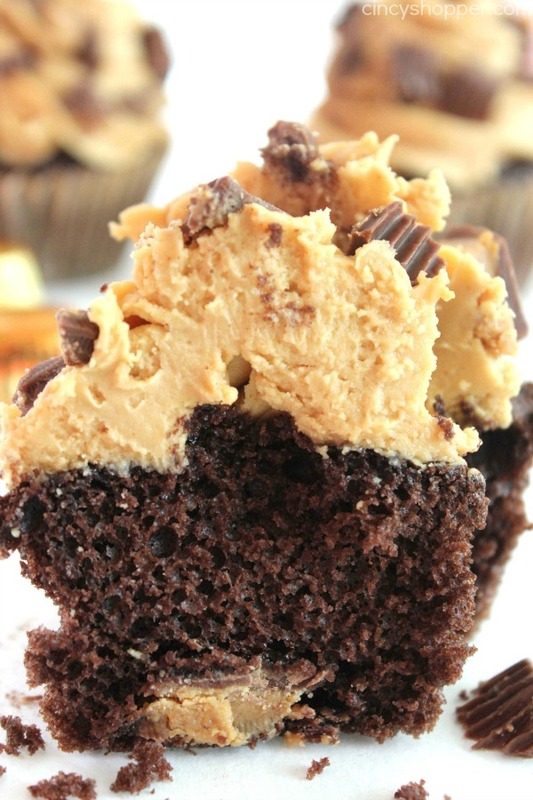 The frosting recipe makes TONS so you can really load it on the cupcakes. I chopped up any pb cups beyond the 24 that were put inside the cupcakes, and “sprinkled” them on the frosted cupcakes. I also drizzled some Hershey’s syrup over them too. Haven’t tasted them because the are for a work party tomorrow, but the frosting is delish! How many cupcakes does this make? I can’t see that info on the recipe! 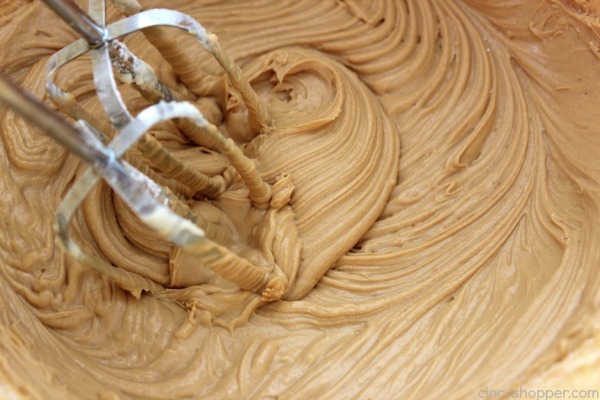 This peanut butter frosting is awesome!!!! 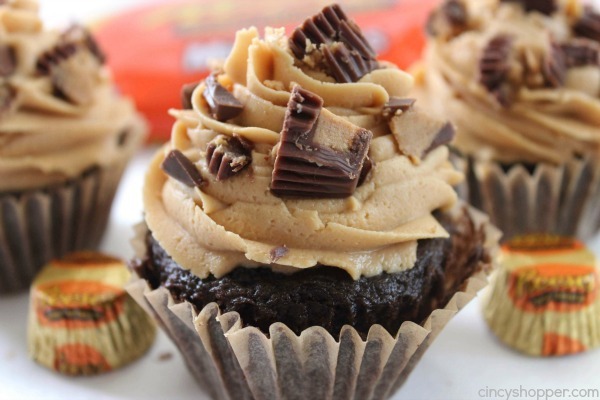 I made devil’s food cupcakes from a box mix, cut out the centers and added a Reese’s peanut butter egg after they cooled, and topped with this peanut butter frosting recipe and MAN are they good! It’s too thick to pipe (I broke two freezer bags squeezing) but works really well to just frost (thickly). We had our boyscouts cake auction last night and I made these for them and they sold for $55 bucks! I will DEFINITELY make them again, and I think this frosting would be awesome on cinnamon rolls too – I’m going to try that next. Thank you so much for this recipe!